Oh I love the Islands also! Remember wanting to have my ashes scattered from Nuuanu Pali [what a macabre statement, but true!]. These cakes sound so like ‘me’ I just have to try them next weekend 🙂 ! Quinoa AND sweet potato: foodie heaven for me tho’ I would not have minded the chicken-lime skewers either. And now to go look up Nicole’s site!!!! Neither have I and am vacillating twixt that and the wonderful Sydney Botanical Gardens above the Opera House!!! Actually quite a happy choice if one is sensible!!!! I AM NOT IN A HURRY EITHER, THANK YOU!!!! The cakes are indeed quite colourful. I’m going to have to give quinoa a try one day … hopefully when my pantry clearout progresses further. For some people, quinoa is an acquired taste. I just read in a cooking forum that some folks are turned off by the appearance of cooked quinoa. I happen to love it, and I enjoyed it from the first time I had it. But it must be well rinsed, otherwise it will taste kind of bitter. I’ve yet to make quinoa patties, It’s usually in salad mode that I eat it. So many great ingredients in this recipe Sally! And I can imagine the crunch! Very nice take on quinoa AND sweet potatoes… loved these cakes! Love the colors in this recipe! My sister was just giving me a recipe for farro and zucchini cakes yesterday- such a great way to make healthy grains into something a little more friendly for the non-adventurous eater! I love the Secret Recipe Club idea as well!! How did you get involved in that? Jamie, it’s been a loooong time – I’ve been a member of the SRC for over 2 years now, and love it! if you are interested, log into the site and drop an email to the moderators. I know there is a long line of bloggers waiting, but some people drop out, giving a spot to newcomers… would be great to have you as a part of the group! Yum! I’m always ready for another tasty quinoa recipe and these sound delicious. Did you serve them plain or with a sauce? Hello, SeattleDee! I served them plain, actually. But of course, they could go well with many simple sauces on top – maybe an avocado cream sauce? or some type of a curry concoction? Me too, love sweet potatoes in any type of recipe! Another way to serve quinoa! I have a large bag of quinoa and my family is getting bored with the few ways I have to use it. Thankyouthankyouthankyou! Great SRC selection! I rarely make plain quinoa, I feel that cooked by itself it is kind of bland. But it shines in this type of preparation… Hope you try it and love it too! I’m always looking for great quinoa dishes – it’s a great way for me to get my protein. I love this one, Sally! Great SRC pick!! You and me both… I have too many quinoa recipes saved, and not enough opportunities to try them all… story of my life! THanks, Melissa! I think it was a great recipe to start the SRC year! What a great choice! Your black, red and white quinoa is gorgeous — what an explosion of colour and it really comes through in that first photo. Great all-around recipe too. Although… I think I might also link over to those delicious sounding Chicken-Lime Skewers with Apricot Glaze :). (Sally, if you can believe it — and I have a feeling you will 😉 — I just bookmarked some quinoa zucchini fritters last night!!). I hope you will blog about it at some point, that sounds delicious! I’ve have been having a hard time getting on board with quinoa. But the only way I’ve liked it is in patty form like you made. Sweet potato is an addition I hadn’t thought of….sounds yummy! Great SRC pick! Oh my gosh YUM! I want one right now! We enjoyed leftovers for a couple of days, just warmed up in the microwave… delicious! 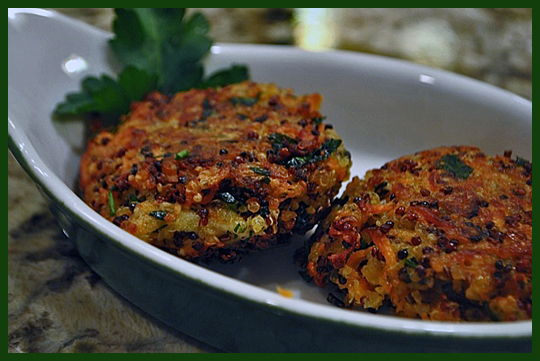 Well, I think you made the right choice with these quinoa cakes! I love the sweet potato infusion…two of my favorites in one bite! I hear so many good things of the secret recipe club. It’s a perfect way to expand horizons and these sound great! I’ve never cooked with quinoa before. Will definitely have to give these a try! so colorful and looks do delicious. I have never used quinoa in this manner before. It was my first time too…. lots of fun! I have wanted to make quinoa cakes for a long time. I love sweet potatoes so this seems like a great recipe to start with. Great pick! These look delicious Sally, and have one of my favorite treats in them, sweet potato. I’ve just started experimenting with quinoa, and this looks like the perfect recipe to do that with. Pinned it and great job this month! You KNOW how much I love sweet potatoes….can’t wait to try this awesome recipe! It’s hard to resist something that mixes sweet potatoes with quinoa, don’t you think? Perfection! These look great! The crispy edges are calling my name, and I love the mix of colors. Adding ginger sounds great too. as to the crispy edges, I am soooooo happy with our Supernova stove! THe thing is awesome! Very cute post Sally! I haven’t tackled quinoa yet but I need to. Thanks for stopping by, Kirstin! Hope you are having fun browsing all sites… quite a nice collection of recipes this month! I love how colorful these cakes are! This is so me- so glad to have found your blog! I make different “cakes” with sweet potatoes all the time, these look fantastic. Sweet potatoes and quinoa are both ingredients you can easily find organic versions of so they’re perfect for me 🙂 Feel free to check out my blog anytime, I write about living an organic lifestyle on a budget (which these cakes would certainly be good for!) Can’t wait to try them. 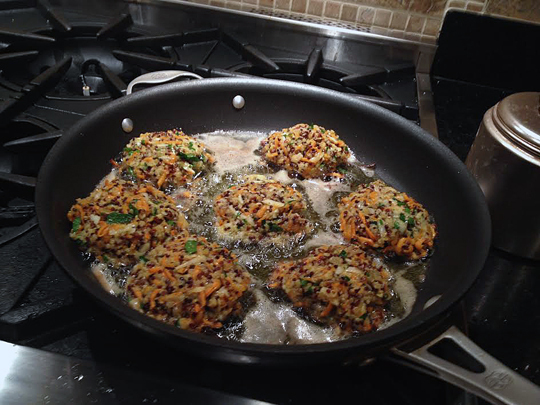 Made the quinoa sweh et potato cakes today, we liked them a lot – definitely something I will make again. Btw, it’s easier to shape the patties, place them on a cutting board sprinkled with panko, and refrigerate them for at least half an hour, before baking. They firm up and will be less likely to fall apart. Great tip! I will be sure to do that next time, they are quite fragile, aren’t they?